When the skies are boringly grey and dark in this winter, one thing definitely brightens up a corner of my kitchen: my lovely persimmons. They are everywhere now in Malmö’s supermarkets and local food stores. Thanks to my uncontrolled excitement when seeing persimmons for the first time this winter, I now still have a basket full of persimmons despite of all my effort to finish them. I have loved the intense sweetness of this fruit until I realized that it had become too much and I needed to do something else with it. All my life, I’ve only eaten persimmons as fruits and never done anything else with it, so this poses as a challenge to me. Given that my bf and I are watching the anime Shokugeki no Soma again (the English name is Food Wars if you want to check it out), I was greatly inspired to experiment with persimmon and create my own master persimmon recipe!! Erm.. I may have watched too much anime that I started talking like them now. A heads-up for anyone planning to check the anime out: as the name suggests, it’s all about FOOD!!! They really know how to make anime food look so good and tempting. However, the content is rather 18+ when it comes to exaggerated food tasting reaction. So erm, if you have any complaints while watching, remember people: I have warned you. During my search for inspirations, I felt really tempted to try making Japanese dried persimmons. Yet concerning this humid weather and my rather destructive cat, I had to push that temptation aside and chose something more practical. Roasting persimmons in the oven sounds easy and I love nothing more than an easy, effortless recipe so that was how the decision was made. I was also hesitating between tossing them in a salad or serving them aside a piece of roasted pork on a bed of bulgur and some greens. But Greek yogurt won me over. My logic was that the intense sweetness of persimmon would go well with the slight acidity and the wonderful creaminess of Greek yogurt. And then it went. I made a simple spiced honey syrup by toasting 1 cinnamon stick, a few cloves, star anises and cardamom seeds in a small heated saucepan, then adding a bit water to let the scents infuse into the liquid, finally adding 1 table spoon of honey and simmering until it thickened. With the persimmon, I sliced it horizontally into thick coins and spread them on a baking tray, drizzled the spiced honey syrup that I made earlier on and then into the oven, 200 degree for 15 mins. For serving, I simply put the roasted persimmon on top of my lightly whipped Greek yogurt and drizzled the rest of the honey syrup over. The result, well, was rather devastating. I’m not gonna lie. It broke my heart. I wasted 2 juicy persimmons for this. The spiced honey syrup was actually very good, I would definitely make it again for something else. However, the persimmon with yogurt.. it was .. okay, like okaaay okay, not good okay. My bf said he likes it, but I think he was trying to make me feel better. I think it was because the persimmons I used for roasting were not fully ripe and some slices were a bit too thin, thus the taste and the texture were very disappointing. Maybe the persimmon was destined to be eaten freshly. Maybe this combination of flavor doesn’t really work. And maybe only the Japanese know how to make good use out of them. Or maybe I just simply don’t like to eat Greek yogurt for breakfast. Since I don’t consider this a success, I wouldn’t share this terrible recipe, plus the picture looks quite self-explanatory anyway. 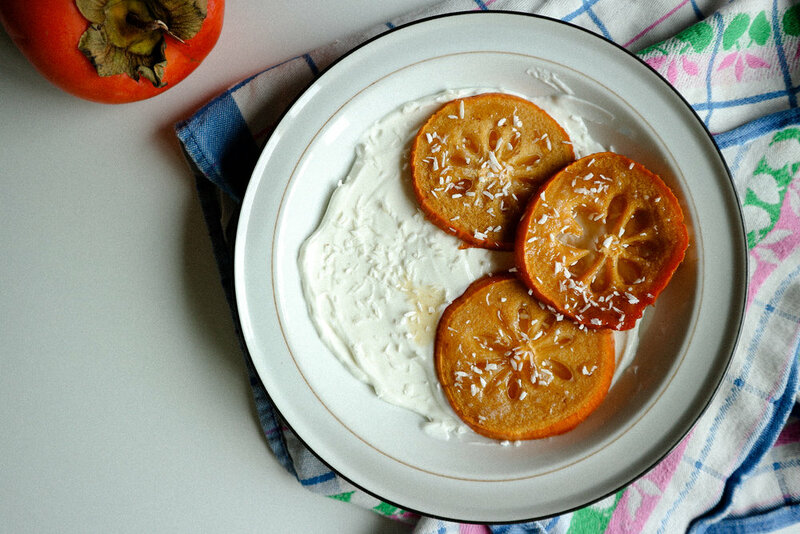 For anyone who wants to try out this breakfast, use a very ripe persimmon and slice em thick please. Don’t make the same mistake as I did.